When running zsh out of the box, "ls -G" produced a list of colors with the default color values. But when I "echo" both "$ LSCOLORS" and "$ CLICOLOR" I get an empty answer. Reviewing "printenv" or "set" does not show these variables either. Unlike other questions that ask how to change LSCOLORS and CLICOLOR, I want to ask where the default options are configured, even though these environment variables are not set (in a way that I can find). Is there a way to see the process in the background, for example, "ls", inside the terminal to trace these to an answer? Why does my terminal start without command prompt? Every time I open my terminal there is no command prompt, it starts blank. I need to wait for half a minute, or write something … then, in reality, it shows the symbol of the system and starts to react. Is there any way to make it work immediately after it's opened? 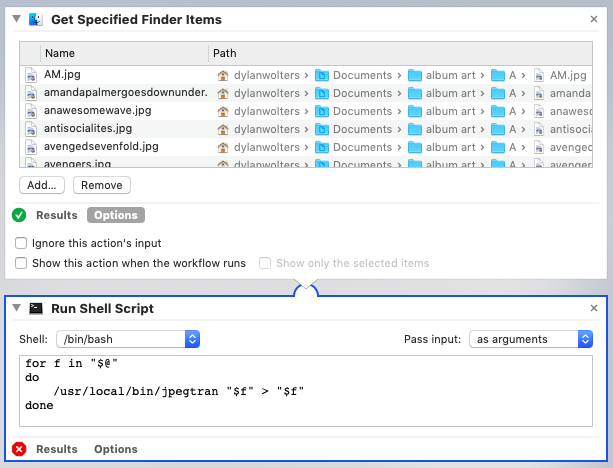 Unfortunately, when I run this, automator says "Empty input file" for each file entered in the tool "Get specified search engine articles". I have searched for information about this, but I do not find anything specific to the failed arguments. I would sincerely appreciate any help, it seems that I can not understand what is wrong and I really do not want to have to reinstall the operating system. It is perfectly normal for this to happen; When logging into the Terminal remotely, Bash performs a reverse DNS lookup. It will only be the same if the hostname is not specified in the network from which you are connecting and there is no response from the DHCP server, or if the reverse lookup against the remote DNS server can not be resolved. But I wonder if there is another option that does not involve invoking the terminal every time you want to mount / dismount. I often have to reconfigure my monitors for work, home, etc. on my laptop with 18.04. I wrote a simple shell alias command on my .bashrc that you configure them for the location (for example, wmc for "config job monitor"). I currently open a terminal and execute the command, but it would be better to just press a key (like the Windows key) and write wmc No need to open the terminal and execute it. How can I execute my command with alias without opening a terminal? He is not reading the color for some reason, not to mention that this works. So the selectors are fine, but how the hell would it go for the terminal to have a border?